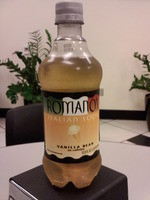 Ok Romano’s let’s not mess this up.You and I have been all over the board on previous sodas; let’s get some consistency going on here.What I have in front of me is Romano’s Vanilla Bean soda... which I am going to assume is a fancy way of saying Cream Soda.The only reason I doubt myself in this assumption is the picture of an ice cream cone on the front of the bottle.Yes I realized that cream soda is usually vanilla, much like the cone on the front, but for arguments sake I’m just gonna ignore that. With the first whiff I’m very excited to try it, as it smells like a delicious cream soda.I can’t drink it yet... I must first remember that with previous Romano’s beverages the smell is always delectable.Ok... I’ve readied myself.Time for drinkin’.Very nice.This is Romano’s strongest drink to date, and since I’m one away from finishing the line of drinks, that’s saying something.I never thought I’d say this, but it’s a very powerful cream soda.Most cream soda’s are quite smooth, which this one is, but they don’t affect your nose.After tasting this cream soda you get the sensation of vanilla throughout your nostrils.It works like Vicks Vapo-Rub, but less intense, and vanilla... which is a plus.On the negative side, it might be hard to drink more than a bottle of this in a given time period.It’s pretty sweet as far as sodas go; so if you don’t think that sweetness will bother you, then jump on in.To put it simply it tastes like intensified cream soda.If you enjoy a healthy dose of cream soda, you’ll love Romano’s Vanilla Bean.